If Gun Control Works in Europe, Where Do Terrorists Get their Weapons? Earlier this year, I argued that it was unfair and immoral to deny European Jews from being able to protect themselves with firearms. They get targeted by terrorists and other thugs who can strike at any time, often with suicidal intent, and even the most effective law enforcement can’t be in all places at all times. Leftists argue that gun control is nonetheless the right policy because everyone gets disarmed. But if that’s true, J.D. Tuccille of Reason asks how terrorists in Europe manage to get so many weapons when there are strict gun control laws. …how did the misfired terrorist acquire his intended implements of destruction in supposedly gun-phobic Europe? Could it be that firearms aren’t quite so unavailable as right-thinking policy-peddlers assure us on their way to insisting that Americans should be disarmed in (supposed) likewise fashion? It’s a question that was also raised in the wake of the Charlie Hebdo attack by terrorists wielding AK-style rifles, pistols, and submachine guns. Observers were puzzled because France’s gun laws are relatively restrictive, and the terrorists clearly hadn’t bothered to navigate the byzantine red tape to acquire their weapons. So, where did they come from? In both cases, the answer is the same. Black markets thrive where legal availability is restricted or forbidden. …Europe has, by and large, more restrictive firearms laws than most American states. But those laws haven’t had much effect on the actual availability of guns, since they’ve been met by defiance and helped breed a brisk underground trade. And they’re certainly no barrier to small numbers of terrorists who have dedicated themselves to harming others and see the law as no hurdle to achieving that goal. The main impact then of restrictive gun laws may be to strip law-abiding people of means with which they might defend themselves while leaving criminals and terrorists well-armed. Amen. Bad guys obviously aren’t concerned about obeying laws, so gun control simply makes it difficult for honest people to possess firearms. But terrorists get the weapons they want. That’s true in France. It was true in the United Kingdom when the IRA was active. And it was true when the Black September terrorists attacked during the Munich Olympics in 1972. But what about the argument that more guns mean more violence? Also writing for Reason, Steve Chapman looks at gun ownership and murder rates. Many of America’s safest states have lots of guns and few restrictions. Vermont has some of the loosest gun laws in America. The Law Center to Prevent Gun Violence gives it an “F.” The state requires no background checks for private gun sales, permits the sale and possession of “assault weapons,” and allows concealed guns to be carried in public—without a license. … In 2013, it had the third-lowest homicide rate in the country—less than one-sixth that of Louisiana. Utah, which also got an “F” on its laws from the Law Center to Prevent Gun Violence, had the fourth-lowest homicide rate. These places refute the belief that loose gun rules and high ownership are bound to produce frenzies of carnage. And even when there is a lot of crime, there’s little reason to believe that it’s because of guns. It’s true that many states have a lot of guns and a lot of killings. But that doesn’t mean the former causes the latter. It’s just as plausible that high murder rates lead more residents to buy guns, in self-defense. Chapman looks at some of the overseas evidence. Britain is often cited for having few guns and—therefore—few gun murders. As Florida State University criminologist Gary Kleck noted in his 1997 book, Targeting Guns, Britain also has a lower rate of murders with hands and feet. But “no one is foolish enough to infer from these facts that the lower violence rates were due to the British having fewer hands and feet.” Homicide is rare in Israel and Switzerland despite widespread public access to lethal weaponry. For even more data, check out this video. But here’s the clincher. 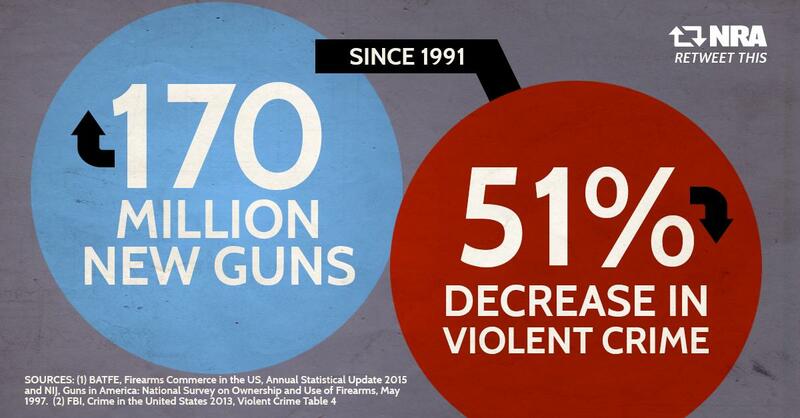 Take a look at this data from the National Rifle Association. Wow, tens of millions of additional weapons and a big drop in crime. Gee, maybe John Lott has been right all along? While many nations keep trying to impose more and more restrictions on legal gun ownership, at least one country is moving in the right direction. Here are some excerpts from an encouraging story about developments from Panama. …the government is set to lift the ban on firearm imports, in an effort to promote personal safety. Public Safety Minister Rodolfo Aguilera said the country will follow in the footsteps of the United States and Switzerland, where the right to bear arms is believed to lead to fewer homicides. …Aguilera…explained that relaxed gun laws have allowed the United States to reduce the homicide rate over the last 20 years. “…for criminals, anything that is prohibited becomes more attractive,” said Hefer Morataya, director of SICA’s Central American Programme of Small Arms Control. I’m not sure I agree with the final excerpt. Criminals are attracted to the notion of using force and fraud to do bad things and that means they’ll probably have guns whether they’re legal or illegal. Making guns illegal simply makes it easier for them to engage in criminal behavior since they know that law-abiding people are disarmed. Which is the point I made when putting together my IQ test for criminals and liberals. If the purpose of gun control in Europe is to keep the “Bad Guys” from obtaining and using all manner of small arms, it is an utter failure. Neither the theory nor the practice of Gun Control work, which should be obvious to the proverbial blind man. On the other hand, if the purpose, the theory and the practice of Gun Control in Europe is to keep the general population, which is essentially law abiding and reasonably honest defenseless, dependent on an obviously incompetent “duly constituted authority” for it’s safety, then European Gun Control is a blazing success. Unfortunately, it appears that respecting the above mentioned possibilities, it does appear that the last mentioned is the more likely, sad to note. Every now and then, someone notices that most obvious of facts, and makes so bold as to say it out loud. The purpose of gun control is subjugation of the masses, not safety. It isn’t about guns, it’s about control. Depends on what your goals are.If they amount to essentially disarming the law abiding, then European Gun Control works quite well. On the other hand, if your goal is to keep criminals and terrorist types from obtaining just about anything that shoots, I refer to man portable arms, then Gun Control ala Europe isn’t worth the paper the regulations are printed on, as should be obvious by now. Europe has a thriving black market… everything from drugs… and flesh to assault rifles are available… expect more lethal weapons on the continent as new smuggling routes are developed directly from weapons warehouses in Libya to the heart of the European union….